If your organization has no legacy email clients, you can use authentication policies in Exchange Online to disable Basic authentication requests, which forces all client access requests to use modern authentication. For more information about modern authentication, see Using Office 365 modern authentication with Office clients. This topic explains how Basic authentication is used and blocked in Exchange Online, and the corresponding procedures for authentication policies. Cloud authentication: The IdP is Azure Active Directory. Federated authentication: The IdP is an on-premises solution like Active Directory Federation Services (AD FS). These authentication models are described in the following sections. The email client sends the username and password to Exchange Online. Note: When Basic authentication is blocked, it's blocked at this step. Exchange Online sends the username and password to Azure Active Directory. Azure Active Directory returns a user ticket to Exchange Online and the user is authenticated. Exchange Online sends the username and password to the on-premises IdP. Exchange Online receives a Security Assertion Markup Language (SAML) token from the on-premises IdP. 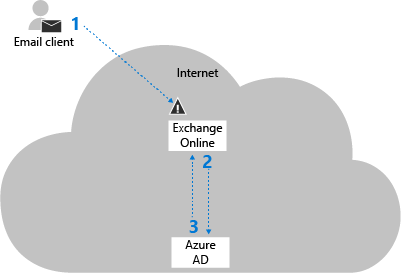 Exchange Online sends the SAML token to Azure Active Directory. You block Basic authentication in Exchange Online by creating and assigning authentication policies to individual users. The policies define the client protocols where Basic authentication is blocked, and assigning the policy to one or more users blocks their Basic authentication requests for the specified protocols. 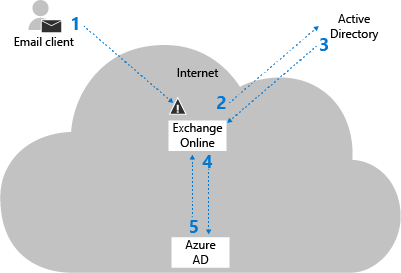 When it's blocked, Basic authentication in Exchange Online is blocked at the first pre-authentication step (Step 1 in the previous diagrams) before the request reaches Azure Active Directory or the on-premises IdP. The benefit of this approach is brute force or password spray attacks won't reach the IdP (which might trigger account lock-outs due to incorrect login attempts). An organization has the federated domain contoso.com and uses on-premises AD FS for authentication. The user ian@contoso.com exists in the on-premises organization, but not in Office 365 (there's no user account in Azure Active Directory and no recipient object in the Exchange Online global address list). An email client sends a login request to Exchange Online with the username ian@contoso.com. An authentication policy can't be applied to the user, and the authentication request for ian@contoso.com is sent to the on-premises AD FS. The on-premises AD FS can either accept or reject the authentication request for ian@contoso.com. If the request is accepted, a SAML token is returned to Exchange Online. As long as the SAML token's ImmutableId value matches a user in Azure Active Directory, Azure AD will issue a user ticket to Exchange Online (the ImmutableId value is set during Azure Active Directory Connect setup). In this scenario, if contoso.com uses on-premises AD FS server for authentication, the on-premises AD FS server will still receive authentication requests for non-existent usernames from Exchange Online during a password spray attack. You manage all aspects of authentication policies in Exchange Online PowerShell. The protocols and services in Exchange Online that you can block Basic authentication for are described in the following table. Typically, when you block Basic authentication for a user, we recommend that you block Basic authentication for all protocols. However, you can use the AllowBasicAuth* parameters (switches) on the New-AuthenticationPolicy and Set-AuthenticationPolicy cmdlets to selectively allow or block Basic authentication for specific protocols. Blocking Basic authentication will block app passwords in Exchange Online. For more information about app passwords, see Create an app password for Office 365. Verify that modern authentication is enabled in your Exchange Online organization (it's enabled by default). For more information, see Enable or disable modern authentication in Exchange Online. Verify your email clients and apps support modern authentication (see the list at the beginning of the topic). Also, verify that your Outlook desktop clients are running the minimum required cumulative updates. For more information, see Outlook Updates. To learn how to connect to Exchange Online PowerShell, see Connect to Exchange Online PowerShell. Assign the authentication policy to users. Wait 24 hours for the policy to be applied to users, or force the policy to be immediately applied. This example creates an authentication policy named Block Basic Auth. New-AuthenticationPolicy -Name "Block Basic Auth"
For detailed syntax and parameter information, see New-AuthenticationPolicy. You can't change the name of the policy after you create it (the Name parameter isn't available on the Set-AuthenticationPolicy cmdlet). To enable Basic authentication for specific protocols in the policy, see the Modify authentication policies section later in this topic. The same protocol settings are available on the New-AuthenticationPolicy and Set-AuthenticationPolicy cmdlets, and the steps to enable Basic authentication for specific protocols are the same for both cmdlets. This example assigns the policy named Block Basic Auth to the user account laura@contoso.com. Set-User -Identity laura@contoso.com -AuthenticationPolicy "Block Basic Auth"
This example assigns the policy named Block Basic Auth to all user accounts whose Title attribute contains the value "Sales Associate". This example assigns the policy named Block Basic Auth to the user accounts specified in the file C:\My Documents\BlockBasicAuth.txt. $BBA = Get-Content "C:\My Documents\BlockBasicAuth.txt"
Filter on-premises Active Directory user accounts that are synchronized to Exchange Online: For details, see the Filter on-premises Active Directory user accounts that are synchronized to Exchange Online section in this topic. To remove the policy assignment from users, use the value $null for the AuthenticationPolicy parameter on the Set-User cmdlet. This example immediately applies the authentication policy to the user laura@contoso.com. This example returns detailed information about the policy named Block Basic Auth. Get-AuthenticationPolicy -Identity "Block Basic Auth"
For detailed syntax and parameter information, see Get-AuthenticationPolicy. By default, when you create a new authentication policy without specifying any protocols, Basic authentication is blocked for all client protocols in Exchange Online. In other words, the default value of the AllowBasicAuth* parameters (switches) is False for all protocols. To enable Basic authentication for a specific protocol that's disabled, specify the switch without a value. To disable Basic authentication for a specific protocol that's enabled, you can only use the value :$false. You can use the Get-AuthenticationPolicy cmdlet to see the current status of the AllowBasicAuth* switches in the policy. This example enables basic authentication for the POP3 protocol and disables basic authentication for the IMAP4 protocol in the existing authentication policy named Block Basic Auth. For detailed syntax and parameter information, see Set-AuthenticationPolicy. This example configures the authentication policy named Block Basic Auth as the default policy. Set-OrganizationConfig -DefaultAuthenticationPolicy "Block Basic Auth"
To remove the default authentication policy designation, use the value $null for the DefaultAuthenticationPolicy parameter. This example removes the policy named Test Auth Policy. Remove-AuthenticationPolicy -Identity "Test Auth Policy"
For detailed syntax and parameter information, see Remove-AuthenticationPolicy. How do you know that you've successfully disabled Basic authentication in Exchange Online? This method uses one specific attribute as a filter for on-premises Active Directory group members that will be synchronized with Exchange Online. This method allows you to disable legacy protocols for specific groups without affecting the entire organization. Throughout this example, we'll use the Department attribute, because it's a common attributes that identifies users based on their department and role. To see all Active Directory user extended properties, go to Active Directory: Get-ADUser Default and Extended Properties. These steps require the Active Directory module for Windows PowerShell. To install this module on your PC, you need to download and install the Remote Server Administration Tools (RSAT). After you get the list of groups, you can query which users belong to those groups and create a list based on any of their attributes. We recommend using the objectGuid attribute because the value is unique for each user. This example returns the objectGuid attribute value for the members of the group named Developers. After you identify the Active Directory group that contains the users, you need to set the attribute value that will be synchronized with Exchange Online to filter users (and ultimately disable Basic authentication for them). Use the following syntax in Active Directory PowerShell to configure the attribute value for the members of the group that you identified in the previous step. The first command identifies the group members based on their objectGuid attribute value. The second command assigns the Department attribute value to the group members. This example sets the Department attribute to the value "Developer" for users that belong to the group named "Developers". This example returns all user accounts with the value "Developer" for the Department attribute. The attribute values for on-premises users are synchronized to Exchange Online only for users that have a valid Exchange Online license. For more information, see Assign licenses to users in Office 365 for business. This example assigns the policy named Block Basic Auth to all synchronized user accounts whose Department attribute contains the value "Developer". If you connect to Exchange Online PowerShell in an Active Directory PowerShell session, you can use the following syntax to apply the policy to all members of an Active Directory group. This example creates a new authentication policy named Marketing Policy that disables Basic authentication for members of the Active Directory group named Marketing Department for ActiveSync, POP3, authenticated SMTP, and IMAP4 clients. A known limitation in Active Directory PowerShell prevents the Get-AdGroupMember cmdlet from returning more than 5000 results. Therefore, the following example only works for Active Directory groups that have less than 5000 members. $users = Get-ADGroupMember "Marketing Department"